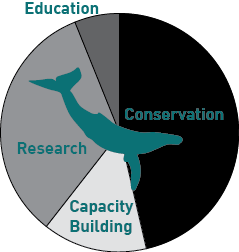 Our work is supported by tax-deductible donations from individual supporters, ecotourism, citizen scientist research expeditions, in-kind donations, grants and lots of volunteer elbow grease! All funds received above the budget shown above are entirely dedicated to the ongoing success of the project. 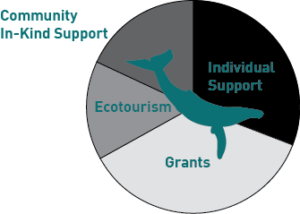 Individual Supporter revenue streams: Humpback whale adoption program; Tax-deductible donations; Citizen science research expeditions; merchandise sales. See a list of this year’s heroic supporters here – HURRAY for you and THANK YOU, friends!